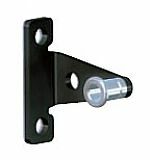 Replacement strike plate for use with the CompX StealthLock Keyless Invisible Cabinet Lock System. For door and drawer use. Fits within 1/2" drawer suspension.